You would normally think of selling covered calls as something you would be inclined to do in a bull market. You look for a stock that is on the rise, or one that you expect to at least stay in a tight trading range in the short term, sell covered calls above the price you paid for the shares, collect call option premium and possibly also make a gain on sale of the shares if called away at option expiration date. This is a more aggressive approach and a great covered call strategy when the market is generally bullish, or you have good reason to believe the stock you have chosen is going up. But can you still consider selling covered calls when the market is in a primary downtrend? Yes you can! If your view of the stock is, that it is more likely to fall before expiration date, you can still make a profit. You take the conservative approach and this is how you do it. If you're doing a buy-write, first take note of the chart patterns and observe the highs and lows as the stock trends downwards. Try to purchase the stock as close as possible to the next "low" in the trend. This would usually be a support line, or a similar distance from the previous trough up to the peak before it. So you have now bought the stock. Next thing to do is sell covered calls at a strike price that is UNDER the current market price of the underlying stock. These are called "in-the-money" call options. They will contain some "time value" but also some "intrinsic value" in the option premium. As a consequence, the premium you receive will be substantially higher than if you had sold out-of-the-money calls and will provide you with greater downside protection should the stock fall further. You're not in a hurry when you're doing it this way. You have until the option expiration date to decide what to do next. Let's say that as expected, the stock rises in a short term pullback over the next week or so, before continuing the downtrend. At this point there is nothing to do. 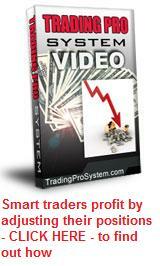 Your position is still in profit, even though it is smaller than if you had sold out-of-the-money calls. The higher the stock rises, the further in-the-money the sold call options will go. There will be more "intrinsic value" than "time value" now, as the delta increases. If the stock reverses and unexpectedly continues north until your sold options expire, your shares will be called away at the (lower) strike price of these options. You will make a loss on the shares but this will be neutralised by the higher call premium you received. Your profit should be only the amount of "time value" above the "intrinsic value" in the call options at the time you sold them. But in a falling market the stock is likely to reverse after the pullback and continue south. If the stock falls rapidly, consider buying back the original call options and selling more call options at an even lower strike price to increase the yield. You will make a profit on the options you buy back because their value will have decreased and the delta will be working for you here. If you now sell more in-the-money call options at the lower strike, this premium will contain some time value, plus provide you with further downside protection for the shares you have purchased. if your timing is right. You can also consider selling covered calls for the next month out as part of your strategy. You have bought shares and sold in-the-money call options over them for a premium of $1.50 per share. In two weeks, the share price drops and the value of those call options is now only $0.25 per share. You buy them back and sell covered calls on the same stock at either a lower strike price or for the following month expiration, for around $1.50 again. You have made a profit of $1.25 on the first lot of sold calls, plus received another $1.50 on the second lot - a total of $2.75 per share which you can use to either protect against further falls or contribute toward your overall profit. Numbers like this would apply to lower value shares where the option premiums are not so high - you just increase the size as the share value increases. But using this strategy on stocks priced at less than $30 per share creates a higher percentage covered call option premium yield than on higher priced stocks. So this is a recommended part of your strategy. 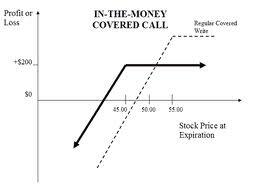 Making a regular income from selling covered calls is just as possible in a falling market as it is in a rising one. It's simply about adapting your strategy to current market conditions.